Wonder if they discussed how teachers can assess homework fairly across the digital divide. For example, if half your students have broadband at home and the rest don't, how do you compensate for that when grading homework? This is a problem in a lot of rural schools today. If you are one of the tens of millions of Americans who can't get broadband Internet because it is just not available where you live, and you have looked into the problem of why this might be, you may have encountered BroadbandforAmerica.com. This is an organization that sounds like it might be promoting greater broadband access for Americans, but look a little closer and you will see it is really a bunch of telecommunication and cable companies (telcos) trying to avoid any requirements to provide broadband that might be imposed by local, state or federal government. Brought to you by over 200 companies and organizations dedicated to expanding the discussion of BROADBAND for AMERICA. They are NOT about expanding the DELIVERY of BROADBAND for AMERICA, they're just about talking about the topic of broadband. And a lot of that talk is just plain nonsense. That headline is not a typo, we recently discovered that Time Warner Cable is quoting $20,000 per mile to bring broadband Internet service to unserved rural areas. Here's how we found out: We conducted an experiment in rural broadband access. 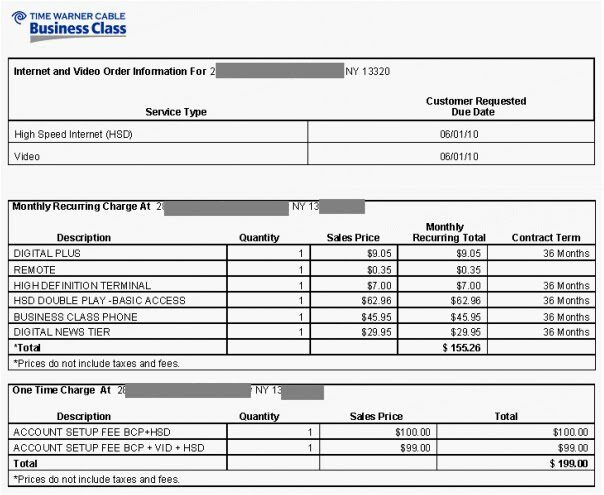 We went to the Time Warner Cable Business Class website. 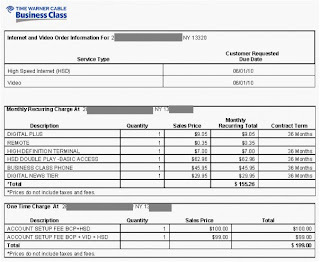 We wanted to show the company we were serious about buying a big chunk of their service (for the record, we were willing and able to pay any reasonable fees for business class service, indeed we still are). We submitted a request for a quote via the website on May 29. This quote included some heavy duty broadband plus TV plus phone service to a location in rural New York state about 50 miles from the capital, Albany. As background we should point out that this area produces a lot of the milk and other dairy products that are consumed in cities like Albany and New York (a lot of people don't realize that the state of New York is America's third largest when it comes to producing dairy products). We got an email confirmation of the website quote right (click the image for a larger view). A few days later we got a phone call from a nice lady at TWC. 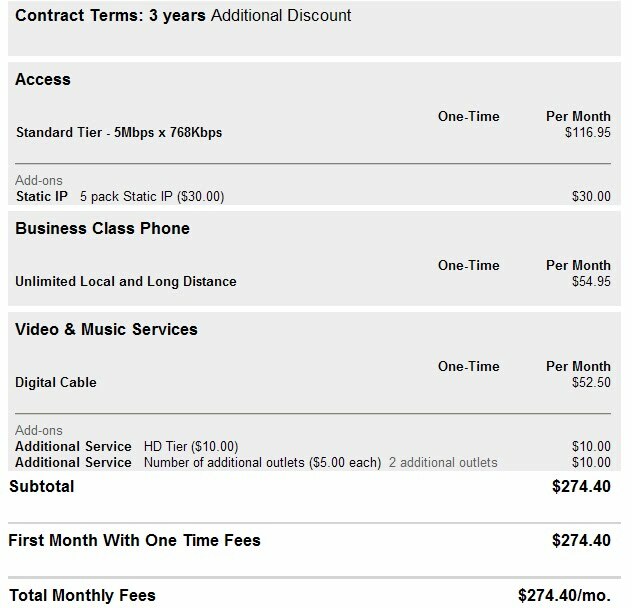 She discussed our order and actually got the price down to $199 per month for a 36 month contract, confirmed in an email on June 2 (click the image for a larger view). We were delighted! In fact, before we signed the contract we asked for clarification that this number was correct. After that, things did not go so well. We were told the number was correct but "The problem at this point is that your address populated for the Albany district and you are not in their footprint so we now sent it to the CNY division to see if you are serviceable under that division. I have not heard back as of yet." And so we waited, and waited. One week, two weeks; and when we asked why it was taking so long, we were told, on July 6, that: "you are outside the TWC footprint and it would be over 100k to get the services to you. I thought this was relayed to you and I apologize if they did not." Over $100,000? The nearest Time Warner customer is only 5 miles from the location for which we requested service. That's at least $20,000 per mile, to string cable? And there are other businesses and homes all along those 5 miles, many of whom are ideal candidates for TWC service. So why the quote of $100,000 to bring cable 5 miles down a road that could yield a lot more than one new customer? Was it just a number they dreamed up to make us go away? Or does it reflect a grossly incompetent mega-company that has such poor controls over its costs that it can't string cable for less than $20,000 a mile? We don't know the answer those questions. But we do have more questions, like why does the State of New York allow Time Warner to cherry pick its customers? Why does Otsego County, home of Baseball's Hall of Fame, allow Time Warner Cable to criss-cross its lands with wires without serving its residents? 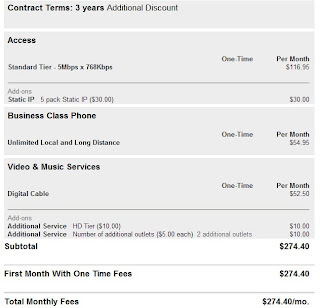 And why does Time Warner Cable think it is an acceptable business practice to demand exorbitant fees from the communities that raise the cattle and corn that produce the food and milk that Time Warner's suburban customers buy at such affordable prices. We'd like answers because right now it sounds a lot like another case of little people who just don't matter to the big people. "In its newly issued Sixth Broadband Deployment Report, the FCC has found that between 14 and 24 million Americans still lack access to broadband, and the immediate prospects for deployment to them are bleak. Many of these Americans are poor or live in rural areas that will remain unserved without reform of the universal service program and other changes to U.S. broadband policy that spur investment in broadband networks by lowering the cost of deployment."